This is landfall. This is recurrence. This is topdeck shenanigans. This is control. This home brewed, silky smooth deck is able to annoy our opponents in many interesting ways. Can You Give Me Some Highlights? Titania, Protector of Argoth + Crucible of Worlds /any effect like this + any land able to sacrifice itself, one of the best being Strip Mine . This is really going to wreck some havoc, especially if you got e.g. Exploration out as well. Roil Elemental : Take over the board in sometimes a single turn, what's not to like? Nissa, Vital Force : Getting the emblem is just too easy..
Good question. Of all our choices in these colors, she seems to fit the theme the best. We might run out of cards in hand, and when we do, we always have the mana to cast her, the mighty Damia, Sage of Stone . Why Would I Play This Deck? 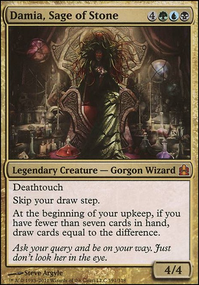 You would want to pick this deck if you really like to see a large portion of your commander deck being played each game. You should also play this deck if you hate only using cards once. 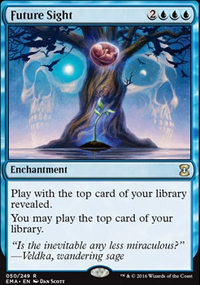 Furthermore, this deck will give you a lot of choices each turn - if you like this, this deck is for you. Why Would I Want to Avoid This Deck? You would want to avoid this deck if you like spot removal and board wipes. You would also want to avoid it if you want to stick to the same strategy every game and have obvious wincons. I hope you find this deck interesting - I do. Last vital piece added - If we've had this card in about 10% of all games, the outcome would have been different. Cheers - now I'm very open for suggestions, since I'm having a hard time tuning the deck further.